David Austin lives in Montreal and is the editor of the recently published book: ‘You Don’t Play with Revolution: The Montreal Lectures of CLR James.’ He recently spoke at an event celebrating Jan Carew’s 90th birthday sponsored by the Department of Pan-African Studies at the University of Louisville in Kentucky. He shared the platform with Eusi Kwayana. Jan Carew, who celebrated his 90th birthday on September 24, has lived an extraordinary and itinerant life, or many overlapping lives, and seemingly many lifetimes. He begins in Guyana, but in many ways his life defies space and time. He is the quintessential diasporic persona, a happy wanderer whose presence helped to shape seminal moments in the lives of people of African and Caribbean descent. Jan reported for the London Observer on the Cuban Missile Crisis from Havana; joined the Laurence Olivier Company in the 1950s and acted in several plays while simultaneously working for the BBC. He also studied dentistry at Charles University in Czechoslovakia and travelled to and wrote about Russia and people of African descent. Jan worked alongside Claudia Jones and other notable Black and Caribbean figures as they attempted to humanize Britain, to liberate the decaying empire from itself and its legacy of colonialism and racism in the 1950s. He wrote several books of fiction, including Moscow is Not My Mecca, Black Midas, The Wild Coast and The Last Barbarian and several generations of West Indians were weaned on his children’s stories. He served as director of culture in Guyana in 1962 and an advisor to the Publicity Secretariat and editor of African Review in Ghana (1965-1966) and was detained when President Kwame Nkrumah was deposed in a military coup. This issue is 18 pages, the largest ever published. It features a number of pages on the Amerindians of Guyana, September being their annual Heritage Month. The “First Peoples of Guyana” have been here for over 10.000 years. The October Newsletter contains positive Guyana News; Regional News; Tourism; and three pages of news from various Guyanese Associations. It also has three pages featuring Guyanese Arts and Culture and four pages on the history and related information on the Amerindians. We hope that you enjoy this edition of our newsletter. 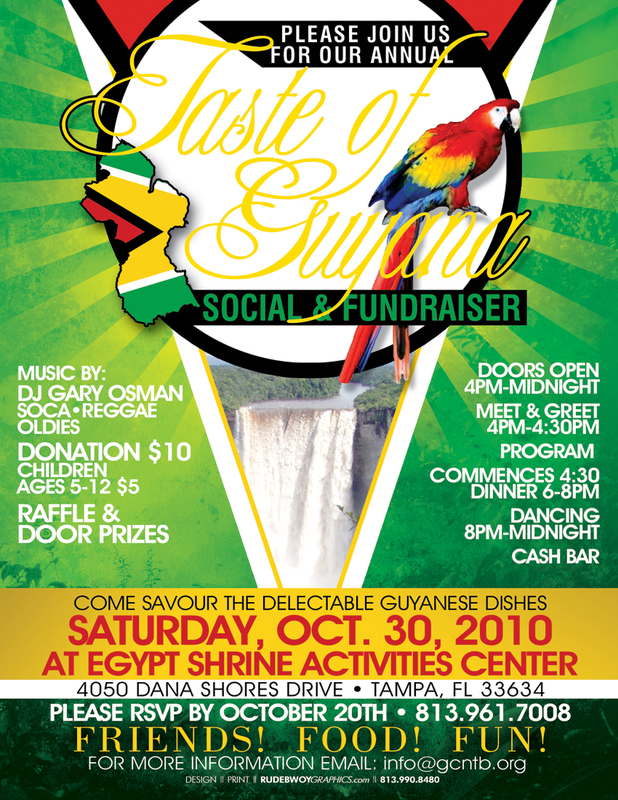 Please forward it to your family, friends and anyone interested in Guyanese news and culture. Cyril Bryan, Publisher and Editor. This article was read in August 2010 at the celebration by Buxton villagers of the 170th anniversary of the village. According to Allan Young, using and official estimates, during the first decade of the village movement the land bought and the houses built and improved both in the Victoria type 25 collective and in the Queenstown type villages made a total investment of some $2.5 million of African savings at a time when there was no lender. Collective labour for village purposes must have added another value to total investment. There are mainly two ways of approaching and seeing village history in Guyana. One is to study villages one by one. We shall find that the oldest villages were those of the indigenous people whom we call Amerindians. Their names are often noteworthy, helping to preserve ancient languages. They are about the only villages with this cultural distinction. There are a large number of African villages, the great a majority of which have Dutch, French or mostly English names which had some significance when they were chosen. There are lastly a large number of Indian villages, with names not far different from the African villages. If we taught history in our schools the finding of meanings of names and reasons for naming will be an interesting project for schools and pupils or students of all races and classes. It would be one step in the direction of a good place to go. There are several villages over many years that have celebrated their anniversaries. The celebrations were either at home or abroad where our people have gone. Last year (2009) the first Village, Victoria, celebrated its birthday. There are three publications on this village one by a long gone schoolmaster Mr. Arno. The second is a booklet by Mr Rupert Dowden, “The First Village”, written in days of the PNC which had come out in favour of cooperatives. The third other was by this writer. They should still be available in Victoria. My forthcoming book will approach village history, not village by village but by discussing the Village Movement. It is my view and I have proclaimed it since reading Allan Younge’s “Approaches to Local Self Government in British Guiana”, that the Village movement was a period of, about fifty years, during which Guyana went through its most significant period of lasting social change. This is part of the reason that some feel strongly about people who misguide themselves and violate the people’s reputation for freedom by using their inherited lands for purposes of unprovoked attacks, not against a hostile government, but against unarmed persons who might be its supporters. In carrying out these acts of brutality they also corrupted the village inwardly, holding the unarmed villagers under a rule of fear and every form of suffering which war imposes. The insanity allowed the expansion of a drug financed and government- backed force called the Phantom whose self-confessed leader has been convicted and jailed in the USA on drug charges. That period roughly from 2001 to 2007 was an unnecessary and unproductive anti-development interruption of the history of at least a small number of villages, including Buxton and Agricola. The world will stand aside for those with a compelling vision and a convincing plan for how to get there. Vision – or a picture of a future state that we are pursuing – is one of the most powerful tools in a leader’s toolkit. Far from being just consultant-speak, Vision is what moves us all forward – improving, adapting, progressing, in a world constantly in flux. Imagine the next time there was an election that the political leaders actually engaged the public in dialogue about substantive issues. Far-reaching, high-impact issues such as: access to a reliable supply of fresh water; how the country would ensure the workforce could provide high-value services/products to the rest of the world; how we might ensure our elders are both listened to and cared for; how we can simultaneously sustain economic development and the environment upon which it de-pends; and how we might contribute to the safety, security and sustain-ability of the people. Imagine the next Board/CEO of your organization engaging employees, suppliers and other stakeholders about the substantive issues lying below the surface of most motivation “talk”. How will we generate enhanced value or improved cost/productivity with a 10 year-old production or IT system? How can we sustain high quality programs/services delivery into the future when 30% of our workforce is due to retire in the next few years and there are no upcom-ing/incoming people with their knowledge and experience in sight? Sometimes today, I think leaders are too busy being “careful” and avoid-ing the difficult discussions, to truly be Visionary. Instead, let’s get our people and community focused on both the outcomes we aspire to achieve, and the real challenges that lie in our way. . The world will stand aside for those with a compelling vision and a convincing plan for how to get there.Vision – or a picture of a future state that we are pursuing – is one of the most powerful tools in a leader’s toolkit. Far from being just consultant-speak, Vision is what moves us all forward – improving, adapting, pro-gressing, in a world constantly in flux.Vision as DialogueImagine the next time there was an election that the political leaders actually engaged the public in dialogue about substantive issues. Far-reaching, high-impact issues such as: access to a reliable supply of fresh water; how the country would ensure the workforce could provide high-value services/products to the rest of the world; how we might ensure our elders are both listened to and cared for; how we can simultaneously sustain economic development and the environment upon which it de-pends; and how we might contribute to the safety, security and sustain-ability of the people..Imagine the next Board/CEO of your organization engaging employees, suppliers and other stakeholders about the substantive issues lying below the surface of most motivation “talk”.How will we generate enhanced value or improved cost/productivity with a 10 year-old production or IT system? How can we sustain high quality programs/services delivery into the future when 30% of our workforce is due to retire in the next few years and there are no upcom-ing/incoming people with their knowledge and experience in sight?Sometimes today, I think leaders are too busy being “careful” and avoid-ing the difficult discussions, to truly be Visionary. Instead, let’s get our people and community focused on both the outcomes we aspire to achieve, and the real challenges that lie in our way. . This article was published in the May 2010 edition of the Guyanese Online Newsletter. Even though the planters in Guyana had expressed interest in introducing Chinese labourers since Emancipation, it was not until 1851 that such recruitment first began. Hello!! Welcome to Tastes Like Home, my virtual din-ing table! I’m Cynthia. I was born and raised in the only English-speaking country in South America – Guyana. Guyana is a multi-cultural society and you will see that reflected in the food I make. Guyanese trace their heritage to every corner of the world, but especially Africa, India, China, Portugal, and to the indigenous popu-lations for whom the region has always been home. I’ve been living in Barbados now for more than a decade and so when I speak of home these days, I do not only refer to Guyana as home but also Barbados as both places contribute in different and significant ways to who I am. I am a trained media practitioner and teach Broadcast Journalism. As a food writer, I write a weekly newspaper column, Tastes Like Home which is published in print and online at Guyana’s leading newspaper, http://www.stabroeknews.com/. Apart from my column, I also write freelance for a variety of publica-tions regionally and internationally. I am a regular contributor to Carib-bean Belle (Trinidad) and City Style & Living (Canada). I also Contrib-ute to U Magazine (a new Health Magazine produced and published in Trinidad & Tobago. 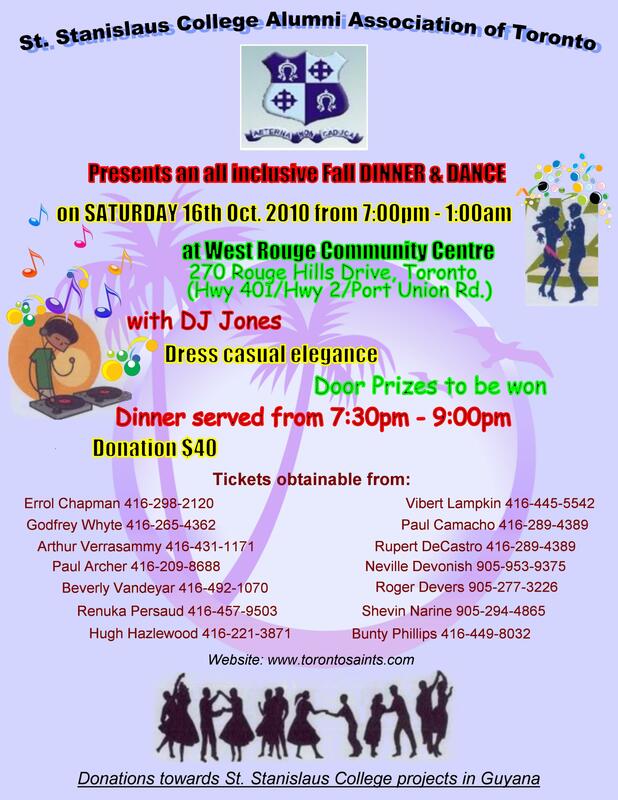 St. Stanislaus Dinner-Dance Saturday October 16, 2010. GUYANA CULTURAL ASSOCIATION OF NEW YORK, INC.
at home informing his wife that he was trapped. Started Army life as a volunteer. Joined the Guyana Defence Force, where he became personal bodyguard and driver to Brigadier Price. Retired at age 40 as Staff Sargeant. Later recalled and placed in charge of the Maritime Post in Kingston, Georgetown. Daughters: Belinda, Michelle, Grace, Sandra, Carol and June Brothers: Kenrick and Dennis Sister: Jean; 32 grandchildren and 2 great grandchildren. Attended St Cyril’s Anglican School and the Government Technical Institute. Father: Herman Adams Mother: Lilian Adams. Born May 20, 1953 at Springlands, Corentyne, Berbice); Stockbroker with Nasdaq. Former Vice President at Merrill Lynch. Started his own company: Rudy Bacchus Floor Broker. Was attending breakfast Risk Water Conference at Windows on the World Restaurant, 107th Floor. Home: Matuchen, New Jersey. Was ordained Deacon of the Second Baptist Church in Machuten. Wife: Juana (of Panama) Daughters: Berto and Carla Father: Rodwell Anthony. Mother: Gloria Anthony, formerly of Campbellville, Georgetown. Brothers and Sisters: Herbert Bacchus, Charles Bacchus, Ian Anthony, Trevor Anthony, Camilia Bacchus, Desiree Anthony and Avril Anthony. Father: Bhola Bishundat Family lived at Cane Grove, East Coast Demerara in Guyana.Was awarded the Purple Heart. Attended Wales Secondary School in Guyana and Borough of Manhattan Community College in N.Y. – (Majored in Accounting). Home: 133-23 118th St., South Ozone Park (Richmond Hill), NY 11420. Home: 164 Pennsylvania Ave., Brooklyn. Worked for Forte Foods/Cantor Fitzgerald – 101st Floor, World Trade Center, Tower 1. Husband: Nizam; Mother of 2. Home: South Ozone Park, Queens, New York. Daughter of Sybil Budhram of West Coast Demerara. Worked for Marsh and Maskan Insurance – 98th Floor, World Trade Center. Wife: Seeta Father of 5. Home: Jackson Heights, Queens, New York. Children: Aneesa, Aseefa, Saeed, Farhaad. Father and Mother: Mohamed and Nazmoon Ifhak. Sisters and Brothers: Bibi, Katiza, Nazir, Jamir, Hamid, Shahabadeen. Grandparents: Noor and Farida Hoosein. Worked for Fiduciary Trust Company International. 97th Floor, South Tower, World Trade Center. Home: 127-23 102nd Road, Richmond Hill, NY 11419. Worked for Windows on the World – 107th Floor, World Trade Center (Tower 1). Sister of Ronald Singh (listed below). Mother: Toolsidai Singh of Rosehall, Corentyne, Guyana. Home: 91st Ave. & 76th St., Ozone Park, Queens, N.Y. Worked for Windows on the World – 107th Floor, World Trade Center (Tower 1). Brother of Kamini Singh (listed above). Mother: Toolsidai Singh of Rosehall, Corentyne, Guyana. Home: 91st Ave. and 76th St., Ozone Park, Queens, NewYork. In our international perspective this week, we examine the need for greater integration of sports between members of the Diaspora and local sporting organizations. ………. There is another important reason why such integration is necessary. Those who have had the experience of living in Guyana and who have migrated, still have emotional and physical ties to Guyana. But a whole new generation is emerging within the Diaspora. They are the children and grandchildren of Guyanese immigrants, and they have had little or no attachment to Guyana. Within the next ten years, these persons who are descendants of Guyanese, but have not ever lived or for that matter ever visited Guyana, are going to outnumber those who migrated from these shores. Unless therefore, a way can be found to create greater links between these persons and Guyana, we may well end up with a situation where these persons would in time have little or no attachment to Guyana. And considering the economic value of remittances from the Diaspora, we can very well over the next ten years see a decline in the level of these remittances. Without these resources the Guyanese economy is going to shrivel. We should therefore act now to integrate the Diaspora into our society and economy. Through sports we can begin this process.